Kicking off another week of interviews with ME Purfield. It’s gonna be a short intro today because my to-do list is more monstrous than normal. 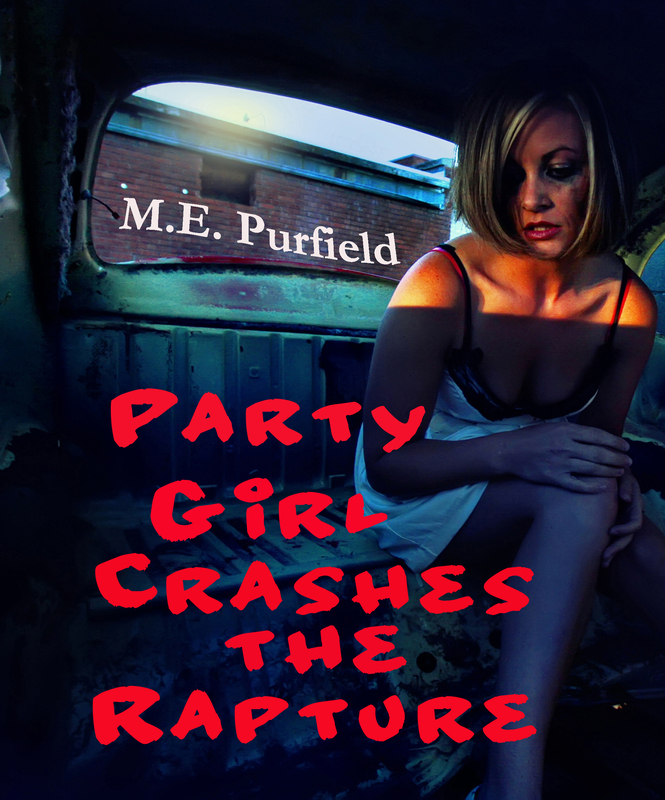 So here’s a description of ME’s book Party Girl Crashes the Rapture. From the description it sounds like an interesting older YA read. It’s Lorelei’s last year of school and she has no plans for the future. Well, she does plan to drink, smoke weed, bang boys, and get as far away from her abusive mother as possible. What else is there to do in a small New Jersey town? But when the seizures start, Lorelei enters a Technicolor dream world where she meets a pink-eyed little girl named Darby. She has something important to tell Lorelei. Something about a murder. Lorelei doesn’t want to deal with Darby and does all she can to forget about her. She even goes as far as finding love and a possible future. But Darby is persistent, so persistent that she starts breaking into Lorelei’s reality. Now she must solve a murder and face a dark secret in her past that could reveal a truth so horrifying that death could be the only way to forget it. Okay, Grace. I gotta run. Sorry about the quick hand-off. Sheesh! That’s like the lousiest intro ever. Hiya, ME! I promise it’ll get better from here. It sure can’t get any worse, right? Now your Muse must be doing a great job inspiring you. What’s the next project they’re helping you out on? Omigosh, why are you yawning? Psychic abilities and mystery sound exciting to me. And I’m curious too—are you like Miki or one of your other characters? What? Listen, if you are writing your characters as yourself, then you better be writing a memoir or something. But since you’re looking at me like (yeah baby) then I’ll say Joni Corso, the lesbian No Wave guitarist who is the protagonist in Breaking Fellini. Except I’m not a girl, or a lesbian, or a guitarist. I think. Hmmm…I’m one of those; two tops. But I also feel compelled to point out to you that I’m not a writer. I AM A CHARACTER. Sorry for yelling. Okay with that cleared up, let’s move on, shall we? What’s your favorite book of all time? I can’t do that. I’m an Angel. Let me see here. I would have to say Robert McCammon’s Swan Song. It just fills me with awe and hope and tells the ultimate story of good and evil with all it’s oniony layers. The onion-y part sounds kinda interesting. I’m not a reader, but will let my author know. So ME, we’re gonna change directions. In your opinion what makes a guy character swoony-worthy? Er, um. A guy who reads comics? Yeah. chicks love that in a guy. Hmm, I guess Elvis and Kurt Cobain don’t count. They were seen last week. Elvis and Kurt are in Paradise, silly. You know, I would love to see The Cramps. Although Lux Interior is the dead one in the group, the band is no more. He was such a showman and really brought feminism to no wave, rockabilly punk. Well it is Heaven, so Lux can have a back-up band. But before you can see Lux, it’s confession time. What’s your biggest writing sin? Writing main characters that scare people, using words LOOK and SIGH too many times, er, and maybe cursing too much. But the writing devil loves me for these things. The writing devil loves you for the scaring and cursing bits, however I’m pretty sure he’s not too fond of the LOOK and SIGH thing either. Just guessin’, though, as I haven’t actually met him. Which makes me wonder — are you more of a rule follower or a rebel? Because why would I want to spend my life retreading what others are doing? Plus, there’s a thrill in taking risks and people enjoying those risks. Hurray! We have something in common, ME. I knew I would find it if we looked hard enough. It’s inspiring to me! Oh, what — other than your Muse, of course — inspires you? Oh, life. Experimental fiction. People. Music. Current events. I guess I’m a sensitive person. Even more in common! Yay! So, what themes do you write about or what do you want readers to take from your books? I would hope that readers hate my main characters in some way in the beginning, but by the end find some kind of connection and respect towards them for what they went through. People should be like books. We should work past first impressions and really dig into getting to know and understand them over time. 100% agree. And, that’s sort of how this interview has gone, ME. Last question, now that we are respecting each other and everything. Is there anything you’d like me to mention to your Guardian Angel? Yeah. Tell her to get off my back and give me my monkey. I miss that little guy. Sorry, she’s not gonna do that, but maybe if you dig in and really get to know her…. My author is nowhere to be found, so signing off for her ‘til tomorrow. May 7, 2012. Tags: author interview, confessions., guardian angel, ME Purfield, Party Girl Crashes the Rapture, Shel Delisle, Winging It!. author interviews. What an awesome book title/concept! That book sounds amazing! May 7, 2012 at 7:58 pm. Permalink.